Tech Nepal (worldlinknepal) Provides Technichal News, softwereTutorails, IT info and tips. Tourism, Art Culture updates, letest news, technology news, blogger seo, softwere inmormation, it solution, Entertainment, You can get here all kind of Nepal Tech News, Nepal Tech Solution,Nepali Tech Blog, Smart Tech Nepal, Nepal Tech Tips,Technology& Nepal, All Tech Nepal,Money Exchange Rate updates. Facebook has recently launched an awesome feature for the Facebook user. Facebook has launched this unique feature for Messenger users. 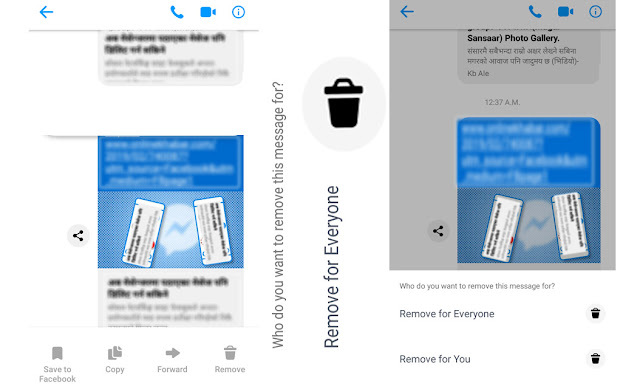 Now , Facebook Messenger users will be able to Delete that messages which already sent to friends from facbook Messenger. If the sender delete messages from his chat box, receiver's message also will automatically delete from the chat box . But you need to be delete the messages with in certain time. it means you need to delete message within 10 minutes after sending the message. Otherwise the messages will not removed from the recipient chat box . With this added feature from facebook , Now you do not have to worry if you send someone to a Message wrongly an by mistake. This new feature was not available yet to remove already sent message to delete from receiver's chat box. at past you can delete message from our chat box only. How to Delete message ? * Press or 'Tab ' on message which do you want to delete.